When the tour guide at the wildlife park tells you that if you show fear, the monkeys will bully you, you’d better listen. If you don’t, you might end up like 60-year-old Zhou Juchang. Not only did a monkey try to take her bag of food, when she refused to give the snacks up the monkey got mad and pushed her off a cliff. As a result of the fall, she fracutred her hip and broke three ribs. Good thing it was only a 20-foot drop, but that still has to hurt. Monkeys are not to be trifled with. 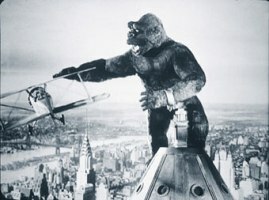 Did we learn nothing from multiple remakes of King Kong? If you go to the animal park and the monkey wants some food, you’d better give it up to him, no matter how fat he is or what kind of diet he might be on. If a monkey takes your girlfriend for a trip to the Empire State Building, just let the professionals handle it.